One of my favorite shows on television is The Biggest Loser. I love watching these people arrive with a dream in their hearts, the drive and courage to start this journey on national television, and the desire to become healthier to benefit not just themselves, but their loved ones. Furthermore, I love watching their struggle (no, I'm not evil) and their eventual success. I don't know about you, but seeing fit and trim men and women performing great physical fetes is not something that gets my adrenaline pumping; watching someone who is "normal" or "average" is much more gratifying to me. I know I'm sounding awful right now and if you know my heart you know that's not what I want. What I'm trying to say is: Watching someone start at point A and fight to get to point B and reach their goal is extremely satisfying to me. It encourages me on a level that no workout DVD can. Earlier this week I threw this video out there and really made myself vulnerable. I didn't say a whole lot about it for a few reasons; 1. I was nervous. I've never video taped myself, let alone broadcasted a video of myself on the internet for everyone to judge see. 2. I took the video with my laptop so obvi its not perfect videographer skills there. 3. I wasn't sure if this is something anyone in the world would even want to see. I'm no doctor or personal trainer. I'm just a girl with a heart for health and fitness and I want to encourage others to take care of their bodies and souls as well. If you didn't see the video, please, watch and give me some feedback. 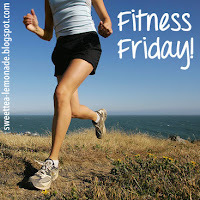 I know that if I were to come across a blog like this, I would instantly follow and watch the workouts. I don't want to feel like the only person struggling with healthy eating habits, unwanted weight, or physical challenges. I want all of us to band together and gain confidence from one another. So, with that said, I have joined forces with Kelly of Honor, Courage, and Commitment for Fitness Friday. If you want to hear some words of encouragement, meet other bloggers who have similar goals, or see some new workouts and recipes, link up below! Like any link-up there are just a few small rules. 2. Link back to our pages with the button. 3. Visit some of the other bloggers and leave them some love - possibly find a new must-read! i love the biggest loser, too! they are so inspiring! I can't get the video to load on my iPad but I will def watch his evening ! I am on a journey to lose weight too but more importantly just to become healthy! Following you now and looking forward to reading more! Kudos to you for putting yourself out there like this – I think it's so inspiring! It can be so frustrating to watch those people in workout videos not struggle at ALL, seems so unrealistic! I know just what you mean about watching real people's fitness journeys, not already crazy attractive people that I'll never look like - those guys are not inspiring and sometimes just make me feel bad about myself. I have struggled with weight and body image my whole life, especially now, now that I'm getting older. You are an inspiration. I think your video is amazing. I still don't have the courage to videotape myself so you go girl! I can't wait for more! I also LOVE The Biggest Loser. Sadly, lol, when my husband was on deployment, I would go get chocolate and peanut butter ice cream from Baskin Robins every Tuesday before the show. Hahaha. I don't know why, it was just my ritual. Isn't that show supposed to make me want to do the opposite? Girl, get out!!!! This was awesome. And proud of you for planking twice!!! High five!!! Now, please go plank for me! ;) No, really, keep it up, sister!! I, too hate doing ab workouts! I'm doing insanity at the moment and there's a portion called pure abs and I skip that dvd a lot! As for the planks, I started doing them on Sunday and I'm challenging myself to add 15 seconds each day. I started off by holding for 30 seconds and now I'm at a a minute thirty. It's hard but I found that if you build yourself to it, it gets easier. No pain, no gain, right?